Organic apple orchard with 19.5 hectares of land for sale with about 17.5 ha of Granny Smith under biodynamic cultivation. The property is currently being converted to a biodynamic Demeter certification. 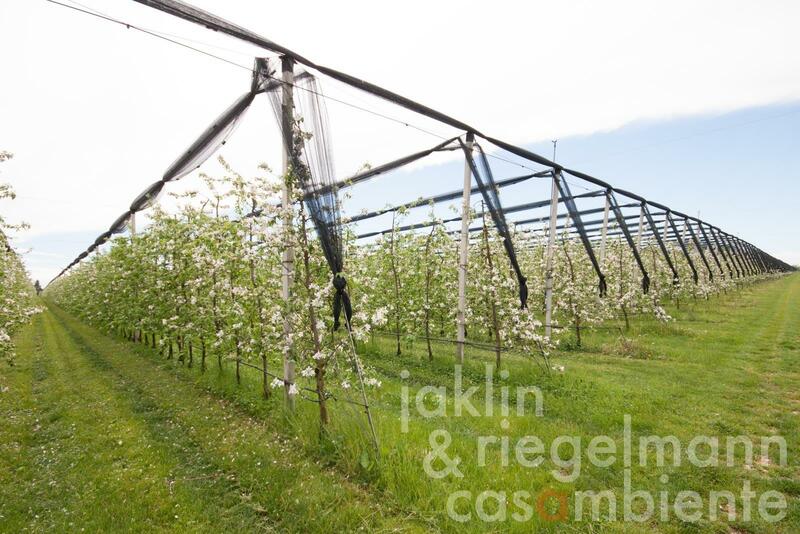 The apple orchard is protected by hail nets (4.20 m) and side nets. Tree spacing is 0.8 m x 3.2 m. Annual production amounts to 800 - 1,000 tons of apples. Computer-controlled irrigation system with remote control for fertilisation as well as surface- and drip irrigation. The property comprises a building (about 350 m²) with storage rooms, office and dining room and 2 apartments on the upper floor. In addition, a bunkhouse for harvest workers with 20 beds, photovoltaic system (350 m²) and 2 wells with a total of 250 litres / sec and 2 pumps (electric and 6-cylinder diesel) are part of this business for sale. This offer includes all equipment and machines for treatment and harvesting. Italy, region Friuli-Venezia-Giulia, province Udine. Electricity, photovoltaic modules, own well water, central heating, air conditioning, telephone, broadband internet access, satellite-TV, garage, private parking.